The family of Mohammad Abu Khdeir, the young Palestinian who was burnt alive by Israelis on July 2 last year, protests that the teen’s name has been added to Israel’s list of terror victims recognised by the National Insurance Institute (NII), and that it appears on Jerusalem’s Har Herzl memorial for terror victims.Abu Khdeir will be also memorialised during Israel’s official Remembrance Day ceremonies on Mt. Herzl in Jerusalem. 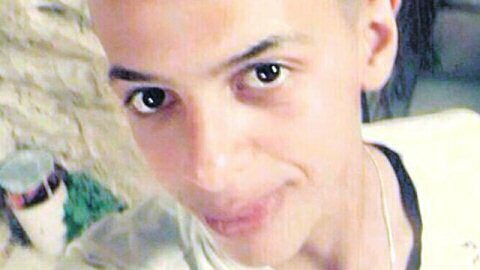 Mohammad Abu Khdeir, 16, was brutally tortured and murdered by Jewish extremists last summer who claimed revenge for the kidnapping and killing of three Israeli settler teens in the West Bank. Yossi Haim Ben-David and two minors confessed to killing Abu Khdeir. “How can anyone do such a thing without consulting the family?” said Abu Khdeir’s father, Hussein, in an interview with NRG, an Israeli right wing news portal in Hebrew. He added that Israel’s decision to add his son’s name to a list of terror victims is tantamount to “hypocrisy for the purpose of propaganda”. “We have no interest in receiving recognition from the state of Israel or in receiving National Insurance Institute payments. We want the three individuals who burned Muhammad to death to receive the punishment that they deserve,” he said. “We want justice”. “We reject placing our son on the terror victims list because it won’t change a thing about the racism of the Israeli occupation as expressed by all of its institutions,” he said. Hussein Abu Khdeir also complained that last November the Israeli police forced the family to remove a mural of Mohammad from the entrance to their home in the East Jerusalem neighbourhod of Shuafat. The murder of Abu Khdeir set off More from AIC.